What are the factors that influence a shed roof pitch? When you look at pictures of sheds you see that there are a whole array of different shed roof slopes. Is it all just a matter of personal choice? Below we go into the historic and practical factors that can influence your choice of shed roof slope. It isn't all science and it isn't all just judgement. Like many things in life a balance has to be struck to get just the right solution for your particular situation. The main factor that traditionally influenced roof pitch was the weather. In areas with high rain and snow fall roof pitches traditionally tended to be relatively steep to encourage water and snow to drain and slide off. Whereas in dry areas roofs could be flatter. The occasional rainfall would not have a real chance to soak in and find the weak spots. With the advent of modern roofing materials such as epdm the importance of roof slope is less. As a roof can be made waterproof even at very shallow, or nominally flat roof pitches. However pitched roofs are still used as roof trusses are a very economic way of spanning between side walls. Pitched roofs are attractive and also can be used for additional space for a shed loft. Having a steeper pitched roof allows for more space in a shed loft. This image shows a relatively shallow roof pitch of 15 degrees. The loft space would be much larger with a roof pitch of 45 degrees. Pitched roofs can also be used to incorporate roof lights angled in a specific direction or dormer windows. Artists commonly use North facing roof lights to allow cool light into their studios. 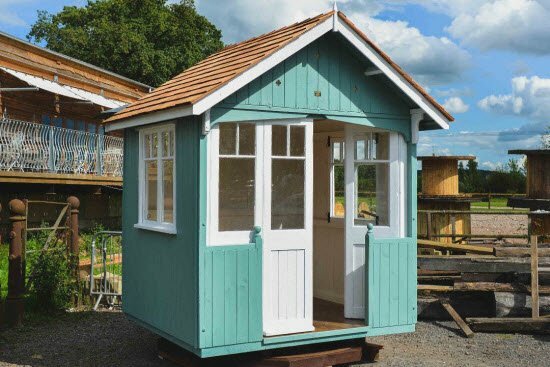 Dormer windows such as the traditional gabled dormer or the more modern transom dormer allow in light, add interest to a roof line and can also give some additional space in a shed loft. 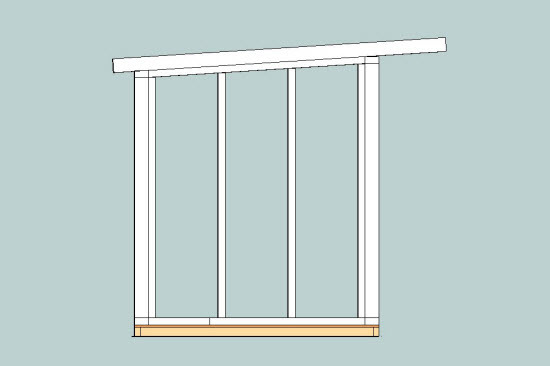 This image shows a transom dormer. The shed roof pitch has two slopes and the window above eaves level allows additional light into the shed. An important factor to throw into a discussion about roof pitches is local planning rules and regulations. 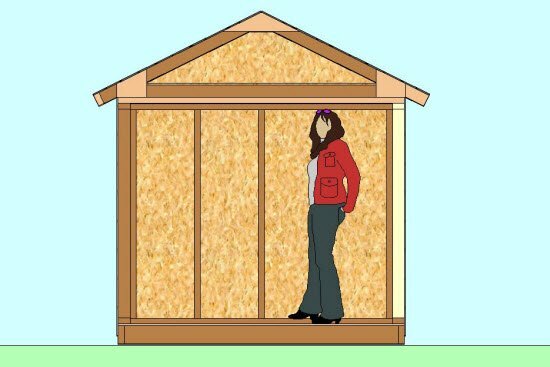 Here in the UK there is a limitation on the height of shed roofs when they are close to boundaries, which many sheds are. Therefore it is very common to see larger sheds that have a very low pitch or flat roof. There are many designs that accommodate this restriction without unduly affecting the appearance of the building. The final point influencing the roof slope is the preferred choice of roofing material. Traditional roofing materials such as traditional clay tiles and timber shakes/shingles need a relatively steep pitch in excess of 40 degrees to be waterproof. More modern tiling and felt shingle systems can achieve lower slopes down to about 20 degrees. 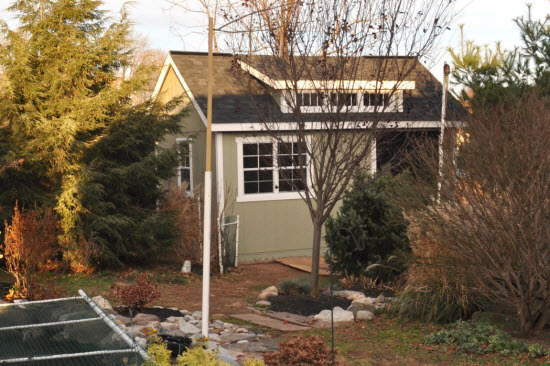 This image shows a shed with a roof pitch of 30 degrees with a covering of cedar shingles. 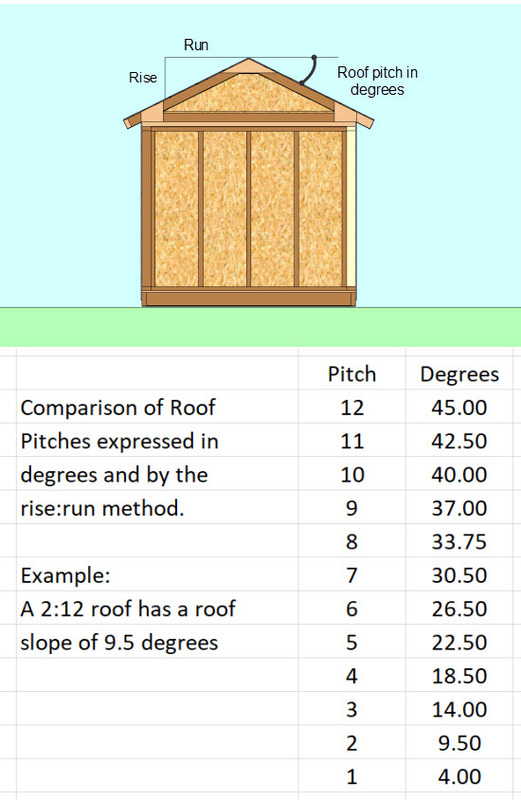 How is shed roof pitch measured? So far I have referred to the roof slope in degrees. That is the way that my engineering mind works. However many roofers work on a ratio system which equates the amount of rise in inches for a horizontal distance of 1 foot (12 inches). Both systems work and I have a table below that will help you to translate from one to the other. 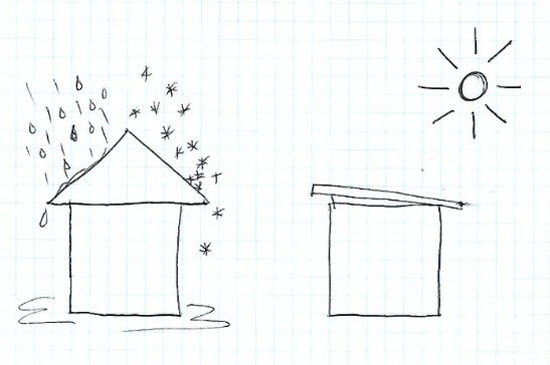 Which is the easiest shed roof pitch to build? In my view it has to be the flat roof with a nominal slope. My reasoning for this is that all that is required is a simple beam. Potential roof framing for a flat roofed shed. The roof comprises a simple beam. Building roof structures for steeper roof pitches involve different methods. Have a look at the shed roof design and shed roof construction pages to see the construction stages for shed roofs of other pitches and types. In summary, traditionally a roof pitch was determined by the climate and the available materials to achieve a dry building. As housing density has progressed and planning rules introduced many sheds have shallower roof pitches due to zoning and planning requirements. Your shed roof pitch may also be influenced by your project specific requirements to let light into the building through the roof or create storage space in the roof void. Whichever roof pitch you choose make sure that you select a roof covering that is designed to be waterproof at the angle that you eventually select.